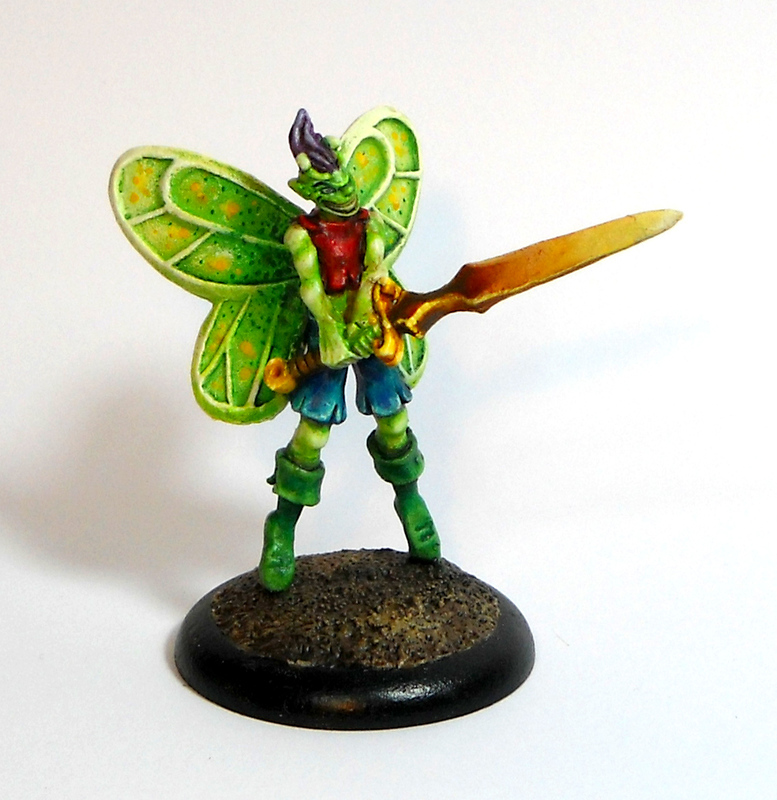 This is an old school miniature, it belongs to the Ral Partha range of models licensed for Advanced Dungeons & Dragons. The production period lasted from 1987 until 1996 when Wizards of the Coast started making their own line of D&D models. 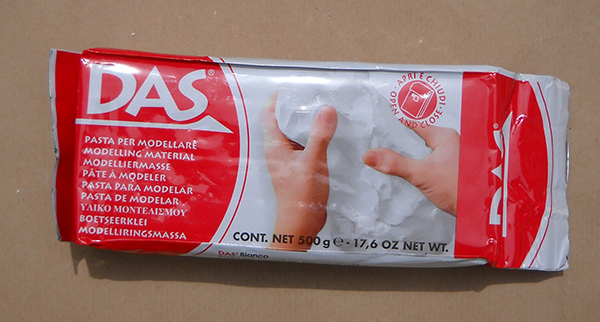 The internet says with the end of the license Ral Partha was forced to destroy all the master molds of the range. So, in theory those models are gone forever, or at least this is what ebay tries to make us believe. 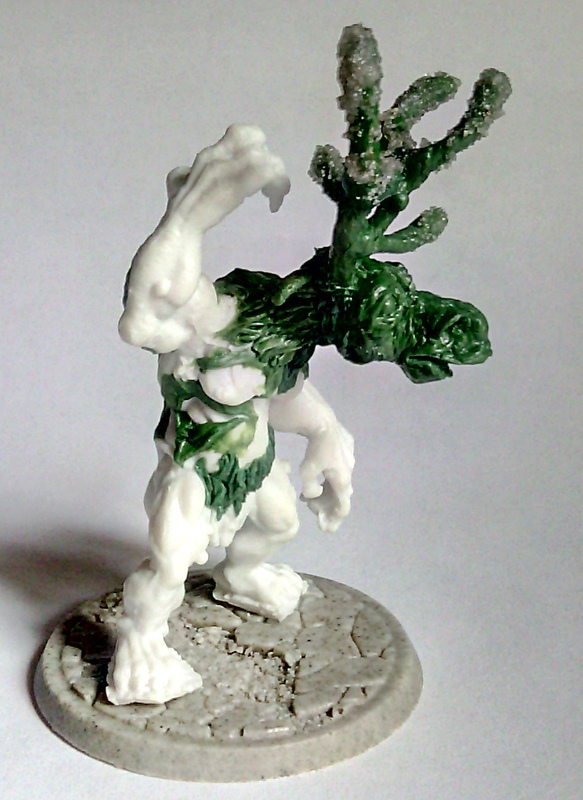 The Shambling Mound is part of the Ral Partha AD&D Monsters range, #11-493 to be more precise, it was sculpted by Dave Summers, and I hope some day he will read this post because I LOVE THIS MODEL!!!! I find it such an amazing sculpt!! so full of personality! I had such a great fun painting it!! Thank you Mr. Summers!!! Also I´m amazed with the challenge of molding it, I have very little experience molding but enough to realize somebody did a great work molding this sculpt in a single piece with such a deep level of details modeled. 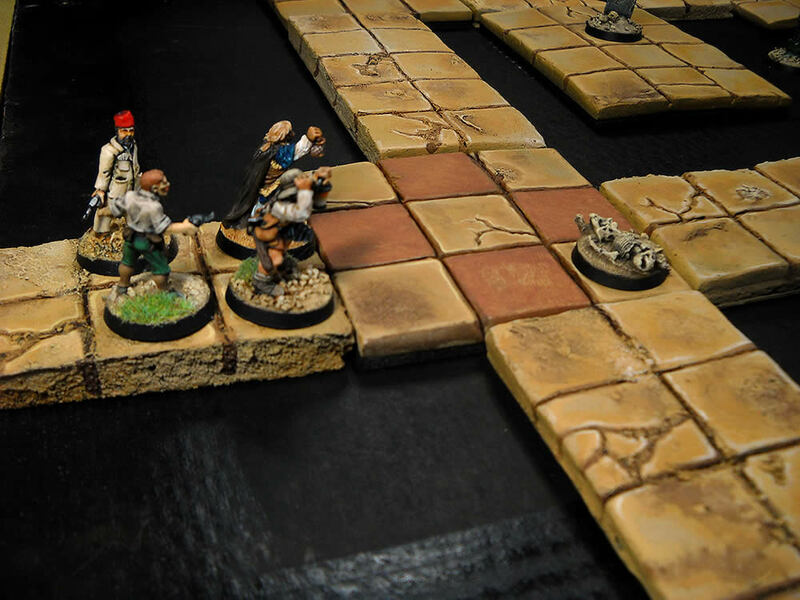 We are playing some DCC scenarios, DCC (Dungeon Crawl Classics) is a new game with an old soul. It has a charming retro flavor from the old school D&D, but it goes further than other retro-clones. If you are in your forties (or more) and are missing those old days of crazy playing D&D almost daily, this is your game! Past week we played “Old God’s Returns”, a kind of Christmas tale, where a really bad guy, a Christmas party pooper do nasty things (kidnaps kids!). The name of this guy is Tapjar, and on their ranks has some little helpers and other creepies. 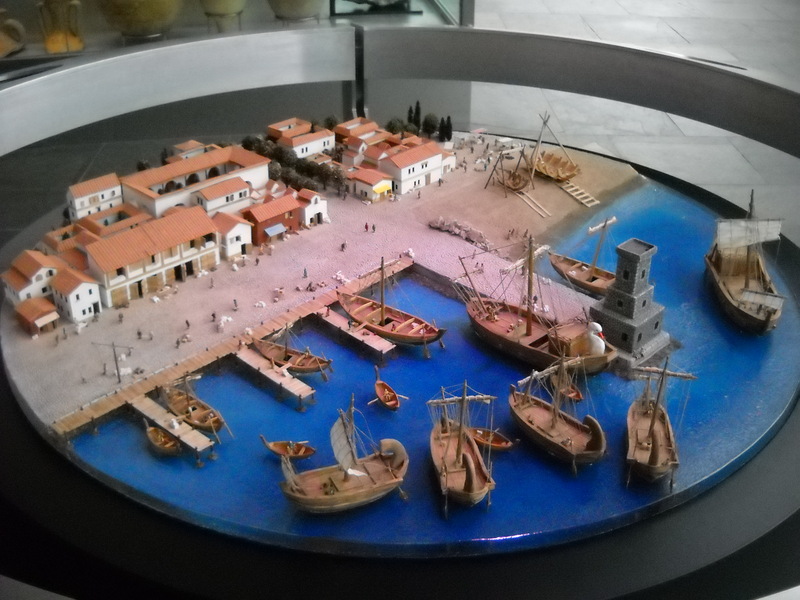 Of course, there are no miniature models exactly like this on the market, so, I decided to make some changes in order to get the right stuff on the table. First changes, on the scenario. 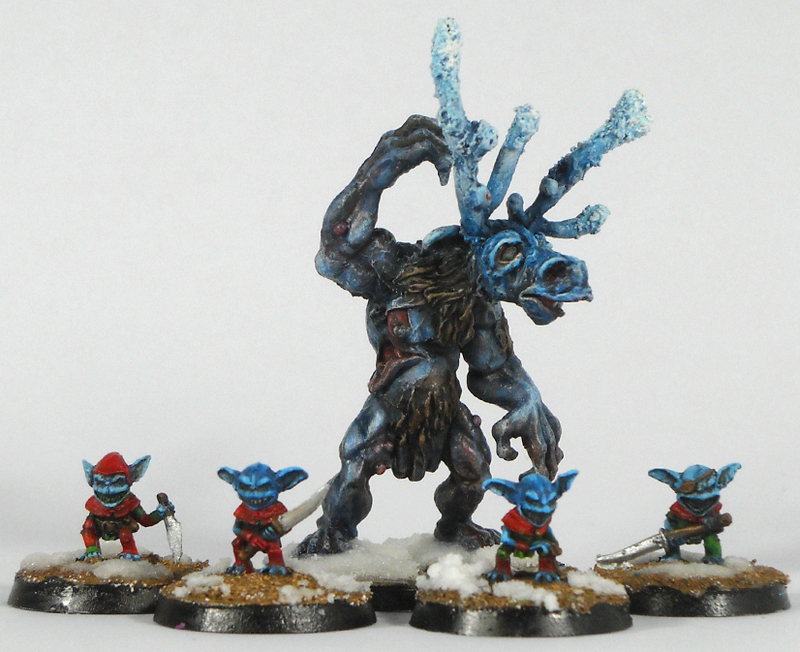 The adventure describes the little helpers (Tontuu) like a kind of evil gnomes, I didn’t find gnome miniatures looking as evil as required, but I stumbled on some nice gremlins from Reaper Miniatures these could work really nice. They have pointy hats, huge knives, and huge badass smiles. 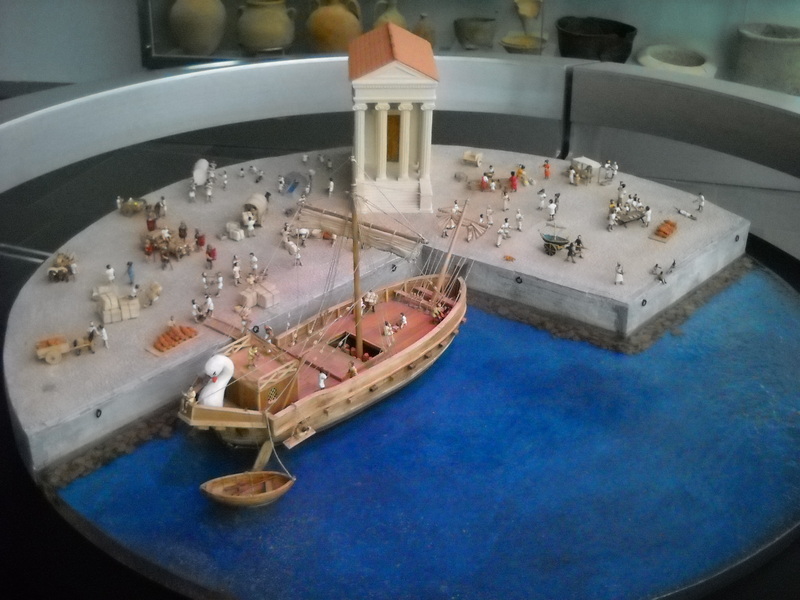 These miniatures are really tiny, by far the smallest stuff I painted recently, on the photo they are based in 28mm bases, so you can guess the real size. 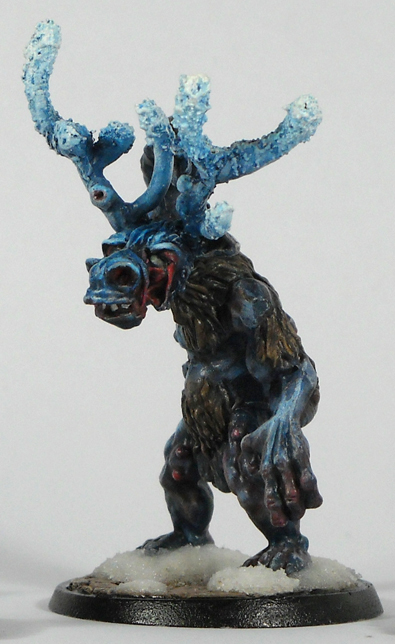 Second change the Ice Demon, in the scenario it has the shape of a praying mantis, but I decided to replace it by the Reaper Ice Toad, it’s a nice model and IMHO has more relation to water than a praying mantis, and it’s a miniature very fast and easy to paint, shame isn’t a bit bigger. 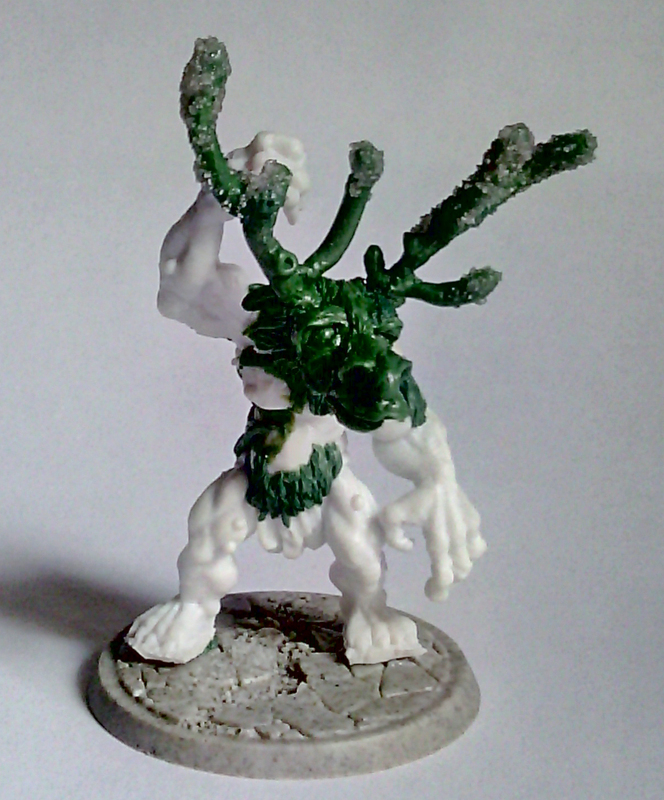 Last step is Tapjar itself, I decided to go for a conversion, the base model is the Cave Troll sculpted by Ben Siens, I picked the one from Bones range, since these plastic models are much cheaper and the plastic makes them really suitable for conversions. I beheaded the troll, pulled a wire and started to sculpt my own head based in the scenario art. 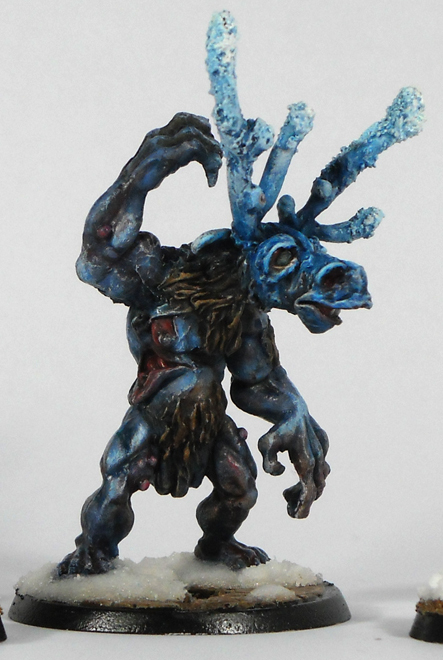 Tapjar is described as a decaying supernatural creature, humanoid and tall, with a reinder head holding an impressive rack of antlers. He is mangy, dirty and patches of skin tear apart exposing their skull. So I went for a kind of zombie look, thinking on a paint stage with blueish purple tones halfway between frozen and rotten meat with patches of decaying fur, all very nasty. The rank of antlers is like frozen and its the source of an aura looking like the aurora borealis, so I added some basing sand resin to work it like a kind of frozen ice when painting. 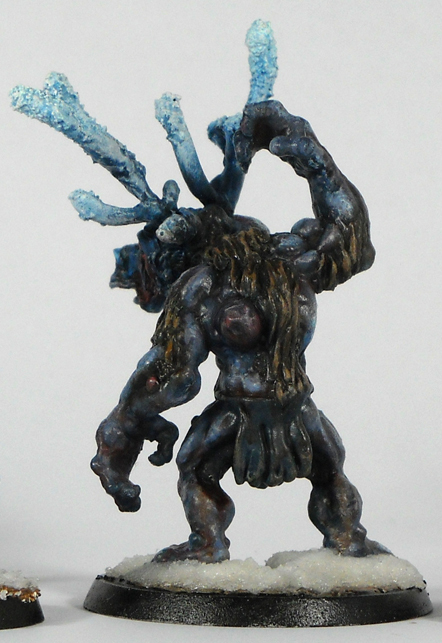 And some pics of the final model painted, click on the thumbnail for bigger images. Basing it’s a resin base from fenrys or epsylon( I don’t remember) and Galeforce9 snow. Some Fairy Meat miniatures from Kenzer Co. 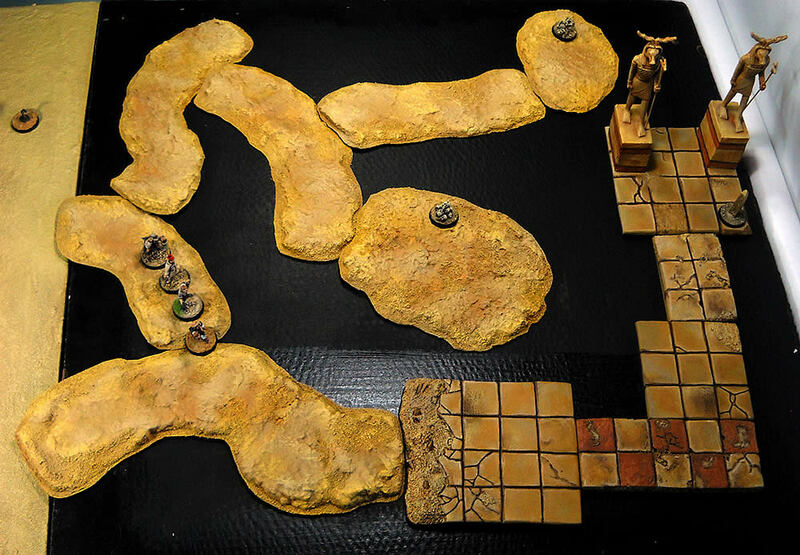 Since a long time I’m looking for a small set of dungeon tiles. The main goal is to use them for pulp Egypt games, but should work also for Arabian fantasy games like D&D Al-Qadim. 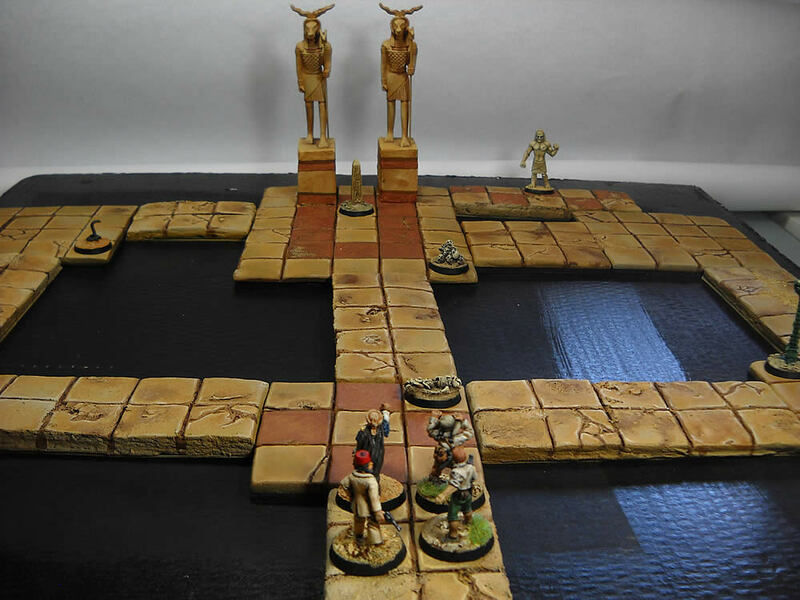 Most of the tiles available on the market go for 100% Egyptian theme or into the “rocky” classic dungeon, none is really balanced half way. 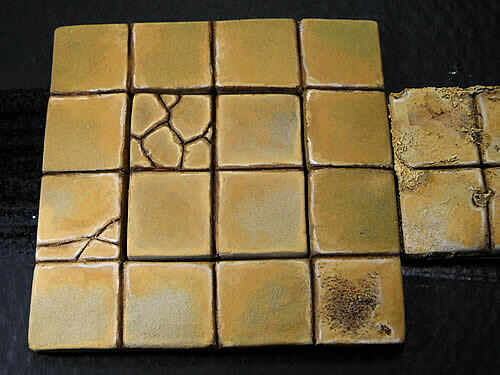 Since I don’t need too many I decided to build my own set of tiles. 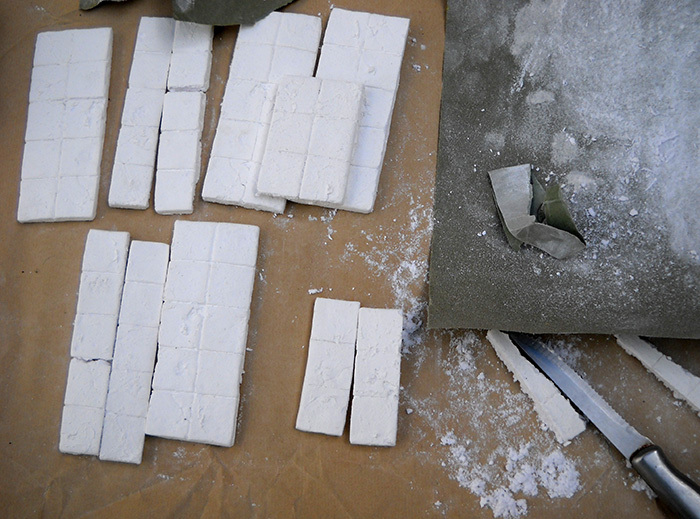 My first choice was to build my own mould and cast the tiles following the huge amount of information about casting available online. Sadly my poor criteria choosing the silicone turned into the worse mould ever seen, I casted it a few times using Sculptamold and got half a dozen tiles of awful quality and very bulky. The feedback after the first batch of castings was really bad, casting is boring, takes more time than it looks like (professional casters you have my respect!) 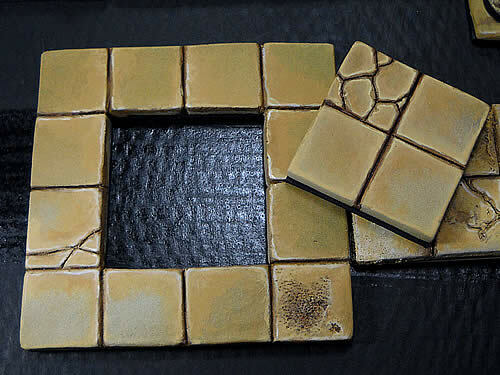 and the tiles were really far from what I expected, but during the casting process I realized the Sulptamold is a product with really interesting properties. So I decided to change the plan. 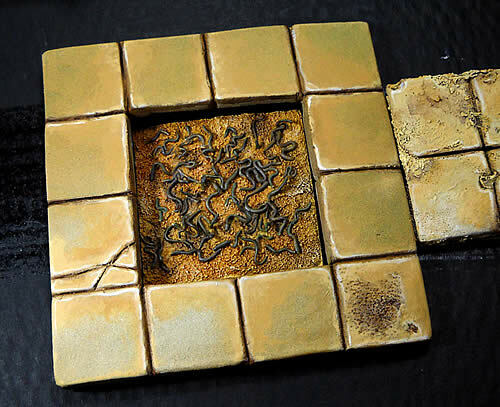 As I had the real fun modelling the original tile for the mould, I decided to model all the tiles, yes one by one, as I said I don’t need a vast production, and in that way every tile will look different. That’s what I got after a couple of evenings modelling. 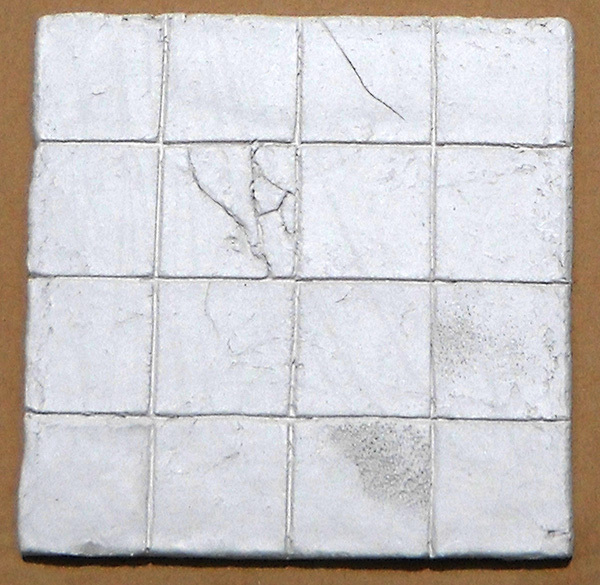 The tile photo allows you to see the detail definition of the Das clay, I think is good enough for that project, as you can appreciate the job don’t requires top-level skills modelling. As modelling tools I used a roller to laminate the clay, toothpick and a modeling lancet to sculpt, and a hair-metal brush for textures. 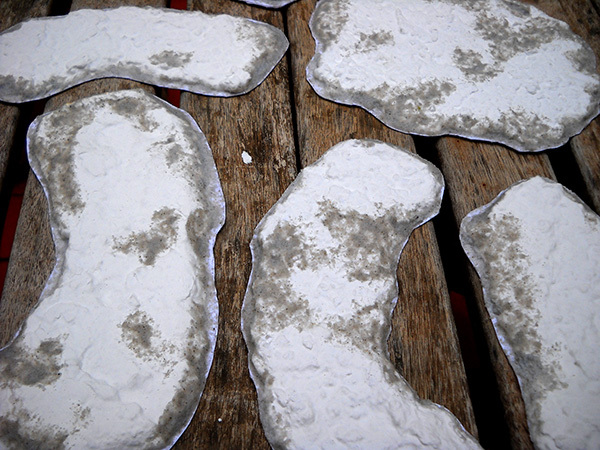 I left the tiles drying, a few hours to hard, but several days to be 100% dried. 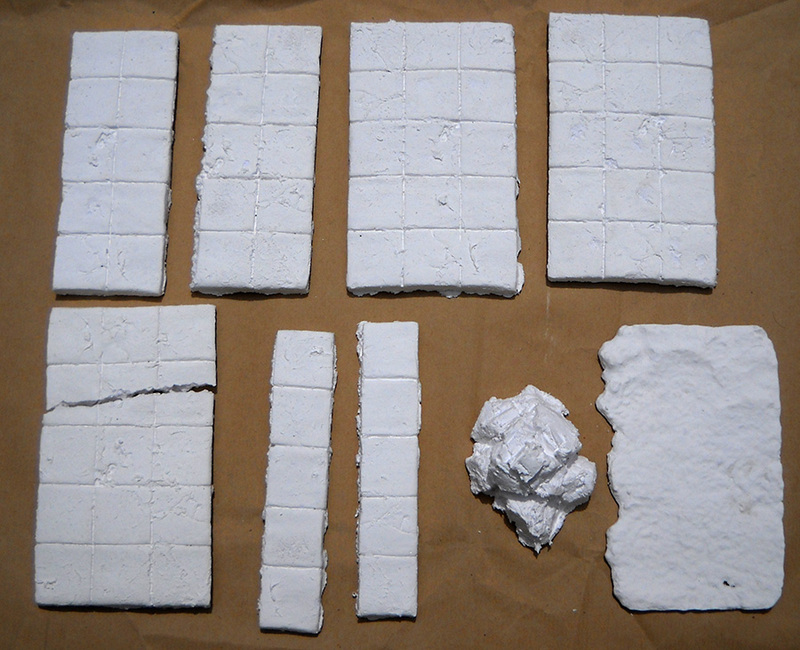 I would say after a few hours, despite it looks dry, if you wet the piece you can soft it and work again with it, like traditional clay, but I didn’t tried it. 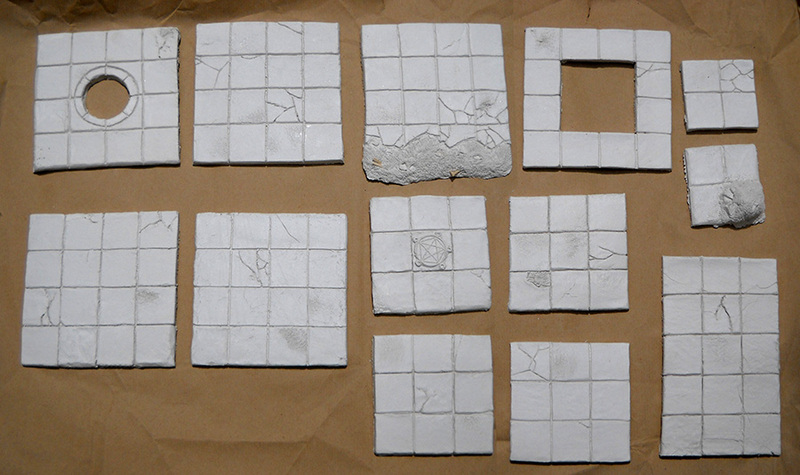 On the meantime, since I only modelled rooms with the Das clay I decided to get back the sculptamold tiles, I sawed and sanded them to build a few corridors for my dungeon. 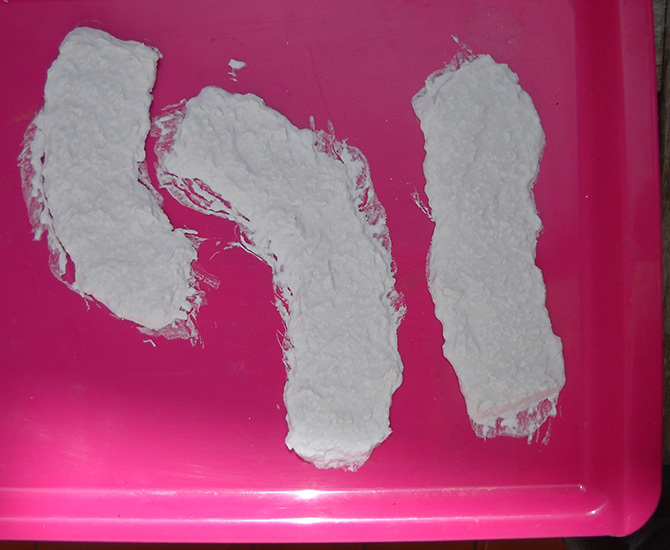 As I previously said I think sculptamold has a lot of possibilities, is good for casting but when half dry it can also be modelled in basic shapes but keeping nice texture. I decided to try a test building some dirt tunnel corridors and room tiles. 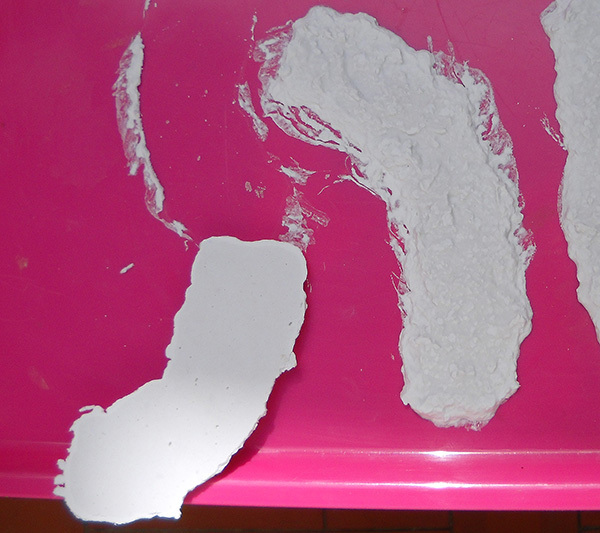 I mixed sculptamold, and as he gets their “porridge” look I simply throw it over a surface in the shape of the desired corridors and rooms (previously I tested sculptamold don’t adheres to that plastic surface). After 30-40 minutes, when it’s hard, I bended the plastic surface to make the pieces “pop” from it, its important the timing, too soon the piece will be too soft and will crack, if too late the possibilities of adherence increase and then it will crack too. 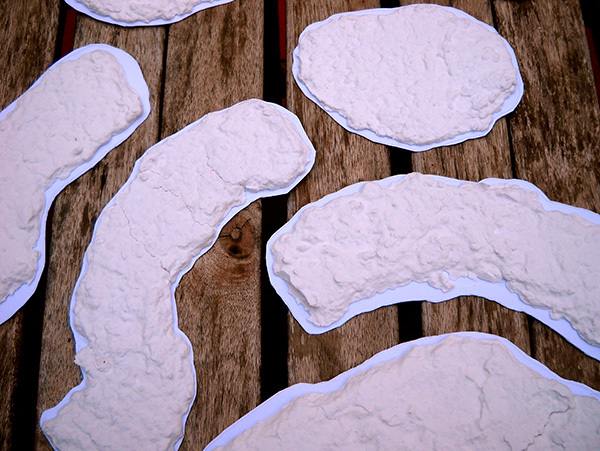 Once removed I let them dry, it took a few days to completely dry. When dried I cut some cardboard bases to give the sculptamold a bit more of resistance, glued, added Vallejo Pumice coarse paste, and ready to go to the painter. 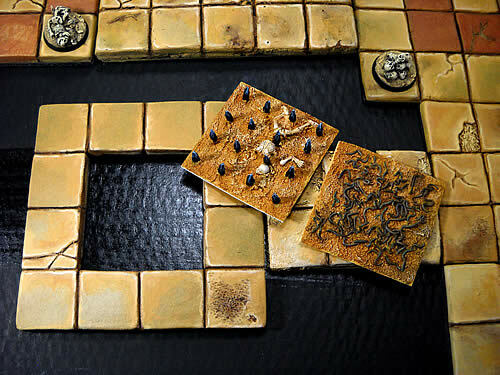 One the floor tiles has a removable central part, in order to replace the central tiles for other bits according the game, traps, stairs going down, in the shot you can see how it looks as the usual trap and the snake pit. 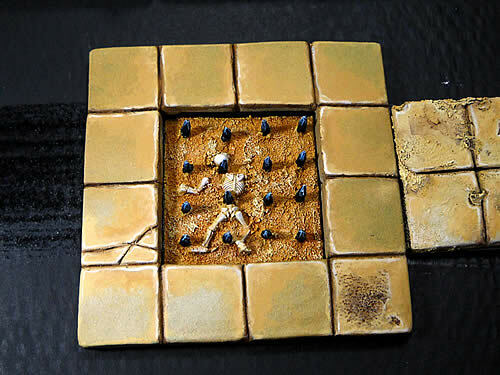 As last note, please a moment of silence for the memory of this miniature, from the arab range of Mega, which after the photo session was varnished with a corrupted Vallejo varnish, previous week it was fine, I used it to varnish the tiles. 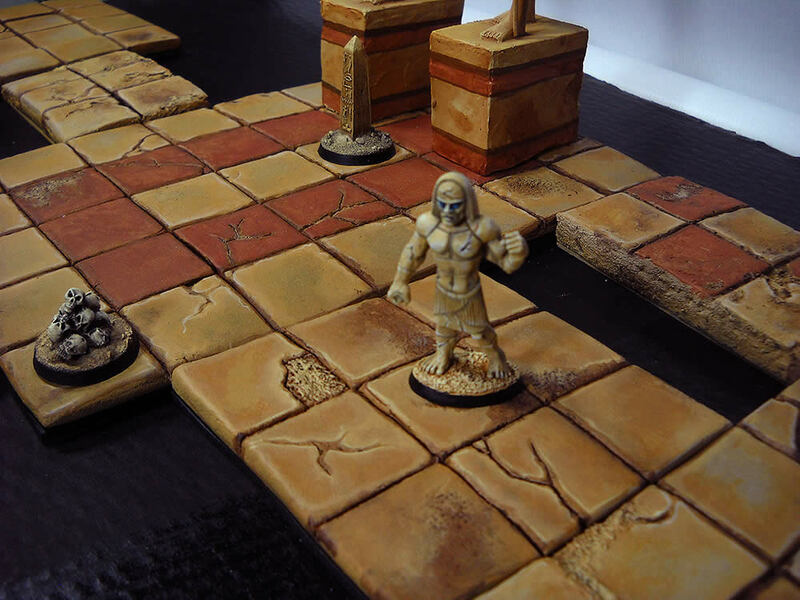 Now you can see how the poor guy looks, the statues and the stone golem where also varnished on the same pack but I succeed to remove most of the varnish. 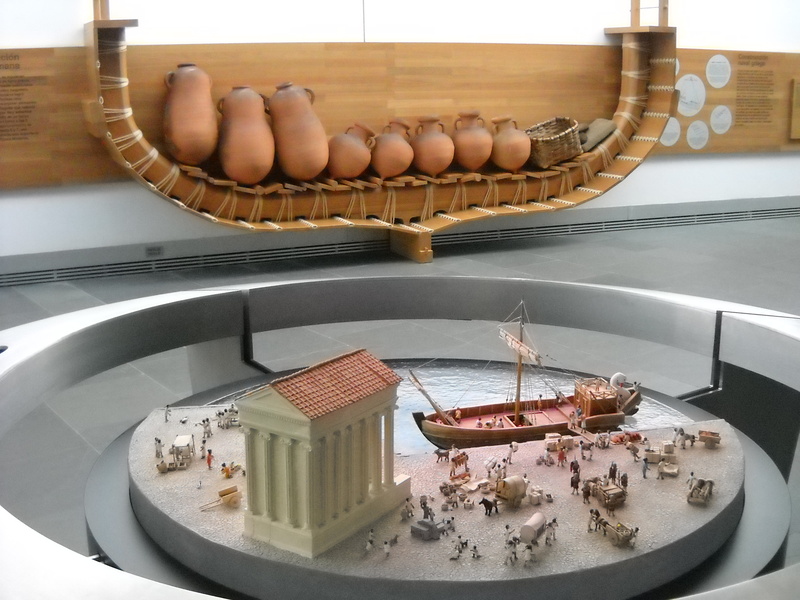 200B.C. 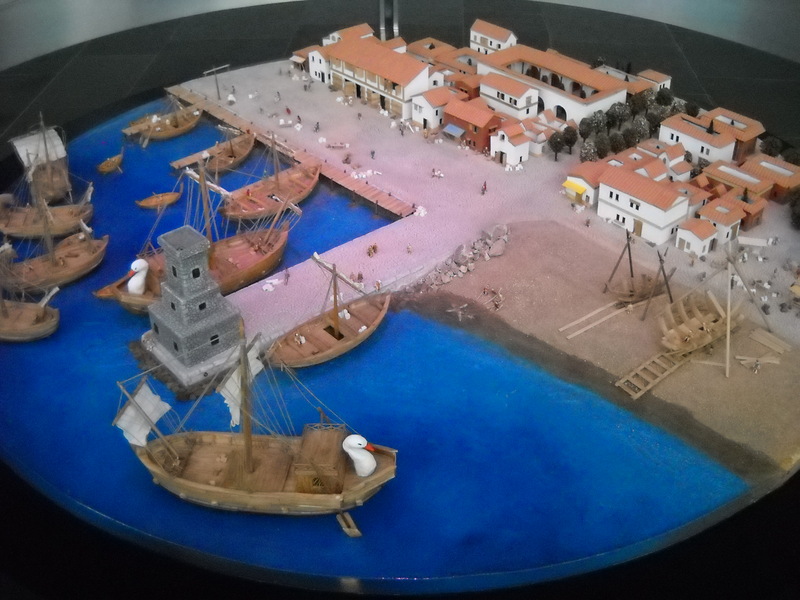 Roman harbour in Cartago Nova area. Drachenfels. The Great Enchanter. A devil in human form, who cheated Death for centuries unknown; a man with appetites so base they lay beneath sanitation; a necromancer, torturer of the dead, dismemberer of spirits; a vileness made flesh; a wizard, a scholar, a monster. Untold are the reaches of his barbarities, uncounted the number of his treacheries, beyond belief the depravity of his practices. Was ever such vileness born of mortal flesh? Deep in the Grey Mountains hidden far away, there is the castle of Drachenfels, a place of death and madness, the lair of The Great Enchanter. This place is the setting for one of the most silly and violently nonsense campaigns for Warhammer Fantasy rpg. It’s a great fun dungeon crawler with a certain death awaiting at every corner, well maybe is funnier for the DM than the players, but the setting succeed to create a paranoid mood like the ambiance in the novel. Yes, because Drachenfels is also a warhammer novel, by Jack Yeovil, I would say is one of the best warhammer novels I ever read, but i haven’t read a lot. 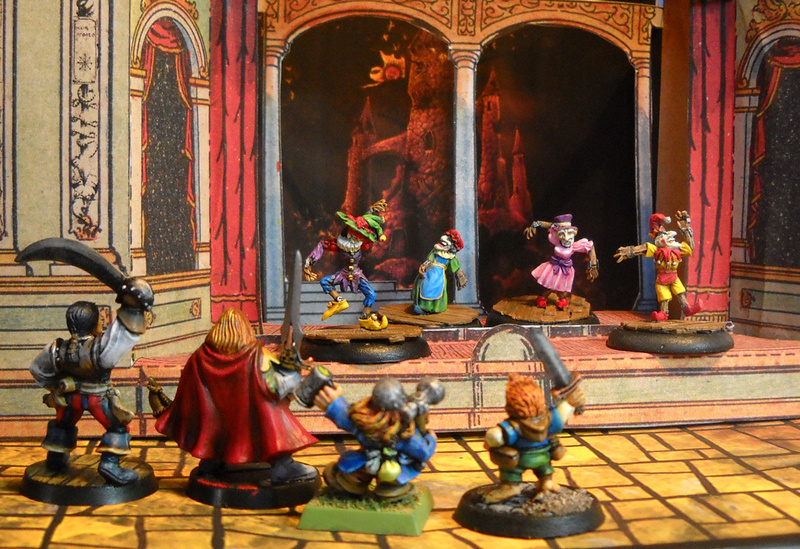 Past year we played this campaign, at a certain point the group of adventurers reaches a puppet theater, where living puppets will perform a parody reenacting the players mistakes and fears trying to taunt them into a deathly combat. 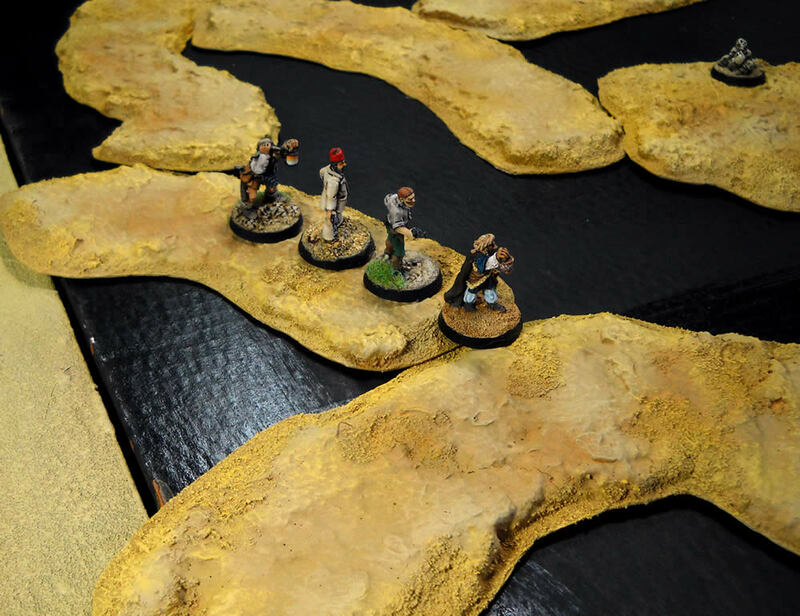 Expecting the group of players will don’t selfcontrol, or succeed to join the satire, I decided to work on some scenery and some miniatures for the upcoming battle. 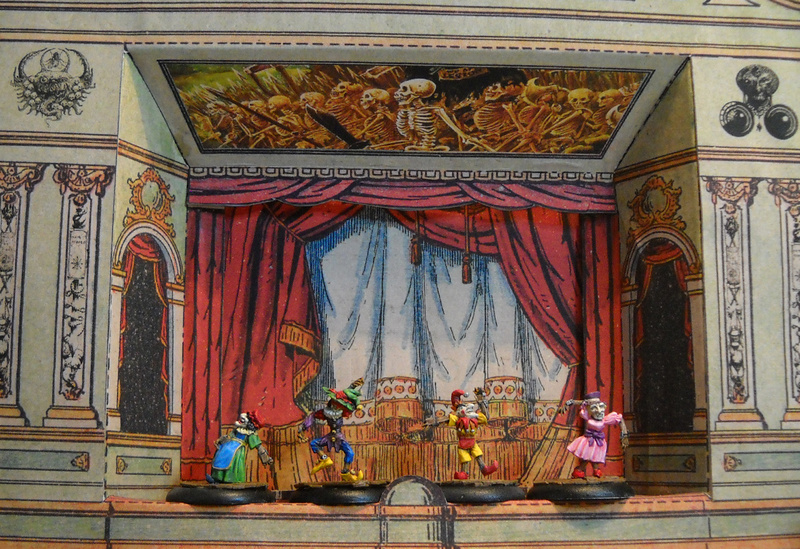 On internet I found a lovely XIX century paper theater ready to print and build. I made some modifications on the file to make it more Warhammer-like. 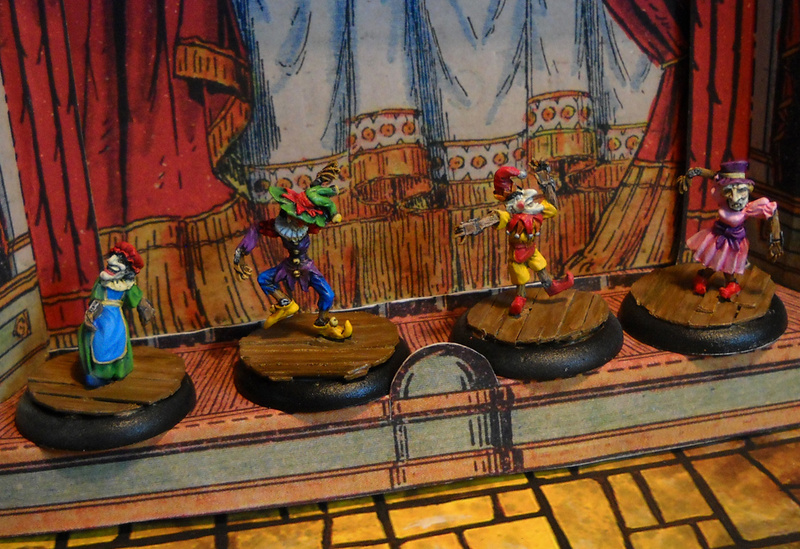 The puppets are Wyrd miniatures, the Marionettes from the Malifaux range.